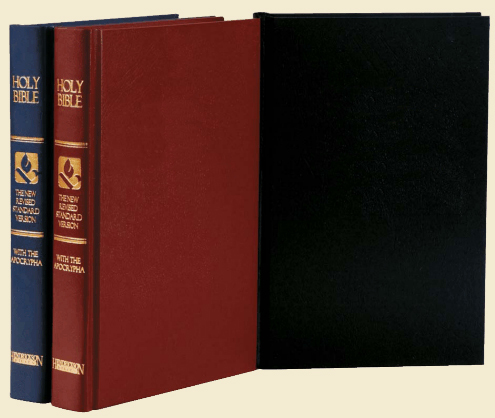 Case of 24 New Revised Standard Version, NRSV, hardback pew bibles with Apocrypha. Available in black, burgundy, blue, or brown please choose color above under Personalization. Our case quantity price ($10.77 each) is 40% off the list price of $17.95. Though they are regularly used in both Protestant and Roman Catholic congregations, the books of the Apocrypha are difficult to find in affordable English Bibles todayuntil now! Readers will enjoy the NRSV's contemporary, literal translation and the easy-to-read text. Churches that reference the Apocrypha in liturgy and worship will appreciate the quality and price of these outstanding editions for presentation, and outreach. Readable 9-point type. Print out a sample page to view print size.